In a world in which the release of barrel aged beers seems to be a weekly occurrence, The Barrel Exchange Project is a meeting of malts with a difference. The collaboration between Wolf of the Willows and Lark Distillery saw the Wolf brewers head to Tasmania to select six Lark barrels to be shipped across Bass Strait. Once they arrived in Cheltenham, within seven days the freshly emptied barrels were filled with an imperial version of the brewery's JSP and left to mature. When the beer was ready, those barrels were shipped back to Lark and - within another week - filled again with whisky. Both the whisky aged beer and the beer aged whisky have been released at the same time, so drinkers can try the two together and enjoy the interplay between beer, whisky and oak. 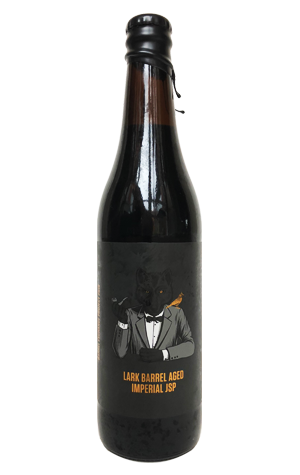 As far as the Lark Barrel Aged Imperial Johnny Smoke Porter is concerned, as ever with Wolf Of The Willows, it's beautifully presented – just more so – with the pipe-smoking, gold-flecked, besuited wolf of the label preparing you for what lies ahead. And that's something suitably deep and austere. While we didn't pick up much in the way of the choc orange or citrus noted on the label, the promised vanilla, mocha, molasses and espresso are present along with plenty of choc fudge and lush caramel, creating a decadent, full and creamy cake like experience. Scott may have held back from proportionally ramping up the smoky character of the original JSP when creating the bigger base beer, but there's still a hint of peaty smoke and fruity whisky poking through, not to mention a whiff of the wolf's leather wallet, suggesting he means business.